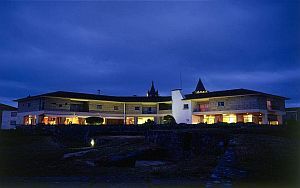 Valenca is right on the northern border of Portugal and approximately 25km from the Atlantic coast. Situated high on a hill top above the Minho River, it looks out over stunning views of the river below and the surrounding countryside. This historical site goes back well before the birth of Christ with evidence of this in the ancient rock engravings left by its earliest inhabitants. The Minho region drew in many people from Europe to Africa because of its fertile soil and the abundant food supply in the form of game and fish. The village's strategic location meant its steep escarpments leading down to the river offered a protection from invading tribes such as the Celts. The Celts first discovered this western section of Iberia in the 6th century BC and several centuries later they were followed by the Romans. The Arabs were the next to invade in 716AD and it took another twenty years before King Alfonso I managed to drive them out. However, two hundred years later the region suffered massive destruction as the Moors struck again destroying everything in their path on route to Santiago de Compostela. Beautiful buildings such as the Monastery of Ganfei was completely raised to the ground leaving only the foundations as evidence of its existence. Because of the tension during the 13th century between the King of Portugal and the King of Spain, it was decided that Valenca needed a wall built around it to protect it from possible attack. By the 15th century the town had reached the height of its prosperity which was reflected in the beautiful buildings that were constructed at that time. One of its most impressive attractions is the 13th century fortress that looks down over the river. This gothic/baroque style fortress suffered extensive damage over the centuries having been subjected to several invasions, but each time this happened it was restored to its former glory. 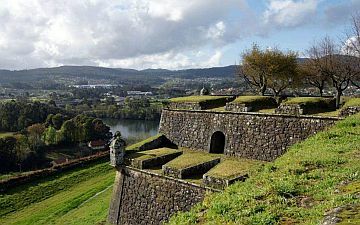 Today this well preserved fortress is open to the public and one of its more intriguing features is a rather special milestone dating back to the 1st century which the Roman's used to mark 42 miles on the road from Braga to the Spanish town of Tui. Along the northern wall are some old cannons that have also been well preserved, and stand poised in the direction of the river looking out towards Spain. There are also some wonderful churches worth a visit dating back to the 12th century, such as the Church of Saint Mary of Angels with its very decorative ceiling, and the Santo Estevao Church, most of which had to be rebuilt at the end of the 18th century. Inside are some 16th century paintings and an unusual 15th century Bishop's throne carved out of oak. Valenca also had its own saint, and a statue of Sao Teotonio was commissioned in his honour, for he was not only Portugal's first saint but also King Afonso Henriques' confessor. For those who wish to learn more about the local history of the town, the Museum Centre Hall has several interesting exhibits. Over the centuries relations between Spain and Portugal eventually improved and in 1879 an international bridge was built over the river enabling both trains and vehicles to cross. This amazing structure was built by the famous French Engineer, Gustave Eiffel, and has since been superseded by a newer version. The bridge obviously makes it much quicker to get across the border, therefore making it possible to enjoy a day trip to the historical town of Tui. Apart from the fact Valenca is not far from the coast and near some excellent golf courses, it is also within easy reach of the Peneda-Geres National Park. The Park is the only one of its kind in Portugal, and apart from the stunning scenery it is also one of the last protected areas for predators such as the Wolf. This impressive walled city can also offer excellent accommodation at the Pousada Valenca do Minho (Hotel Sao Teotonio). Located within a 17th century fort, this elegant hotel is relatively small in size but it has its own restaurant which serves excellent regional dishes, and each bedroom has lovely views of the river. About the Author: This article was written by Susan Bartle who is a seasoned traveller and freelance travel writer. Originally from Canada she currently resides in the UK and recent research has resulted in expert knowledge of the Pousadas and Paradores. Click here to read about other destinations where these luxury hotels can be found. Or visit her travel website covering countries in Europe and all around the globe.